Journaling is a favorite pastime for lots of people, and for good reason. It’s both relieving and relaxing to be able to freely share your thoughts and make notes about a variety of things that are important to you knowing that only you will see what you’ve written in those pages. Whether you’re a long-time journal keeper or you’re just considering trying your hand at it, get ready for something a little different, because there’s a new kind of journaling in town that adds a fun twist. The “Wreck This Journal” journal is unique in the market of notebooks to write stuff down. Designed to bring out the hidden artist and your inner writer, its many pages are filled with wild and fun directives that can be very freeing. For example, a page might tell you to poke holes in the paper, press some leaves or other objects, or scribble with reckless abandon. You can also glue pages together, make a paper airplane, and smear your dinner inside by using a page as a napkin. 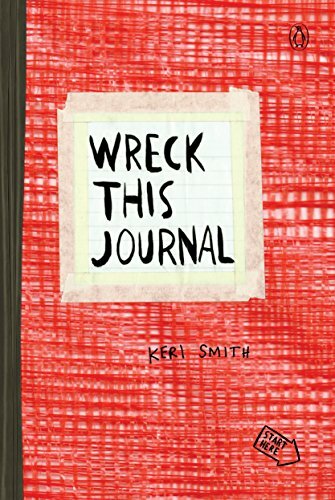 With so many fun things to do, the “Wreck This Journal” journal is a cut above the rest. Having the “Wreck This Journal” on hand to use is great for promoting self-care. Because it allows the person who’s journaling to let loose and be free with his or her thoughts and creativity. After all, what’s more exciting than cracking the spine of a book, or tearing out a page and crumpling it up? Actions like these go against all the rules that we abide by day in and day out, allowing you to explore and have fun all at the same time. It lets you safely live outside the lines for a while, and no one ever has to see it but you. You can also read ahead or just flip a page each day; any way you want to approach it will work. Whether you’re an avid journaler or you’re just interested in trying something new, the “Wreck This Journal” book is worth a try. It’ll keep you occupied for weeks as you explore the many directives, and it’s a great treat for yourself. You can even give it as a gift to someone who could benefit from loosening up a little.